The body is in the developed by Audi Space Frame ASF construction of aluminium and steel. For the first time coming here alongside various materials are used. 69 percent of the building is made of aluminium, steel components, the remaining 31 percent represent, can be found in the rear to the axle loads balanced to distribute. To increase the output runs at 120 km / h speed a spoiler from the luggage compartment lid. In addition, the new Audi TT Coupe is initially only as a 2 + 2-seater coupe offered, the independent Roadster will follow at a later date. The basic measure of the sums under a large flap easily accessible trunk of 290 litres of luggage flips through the rear seat backrests he grows to 700 litres of volume. The sports seats provide excellent lateral support for the salaries are three leather variants to choose from. The cockpit is strictly oriented towards the driver and ergonomically well. As drive, serve two strong gasoline engines. The 2.0 TFSI four-cylinder with FSI direct injection and turbocharging is 147 kW (200 hp). 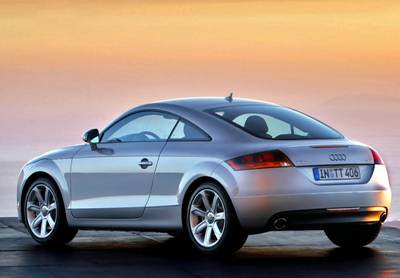 It accelerates the Audi TT Coupe with six-speed manual gearbox in only 6.4 seconds to 100 km / h and provides for 240 km / h maximum speed. At 184 kW (250 hp) brings the 3.2 V6. Its driving performance: 5.7 s for the standard sprint and 250 km / h maximum speed (electronically).